My name is Abdul Majeed Keramat, I am an Afghan Citizen, living in Kabul, I was the Bafel Advance Class student from mid of Oct. 2017 to mid or Jan 2018 at Bafel branch Novida Sector 22. 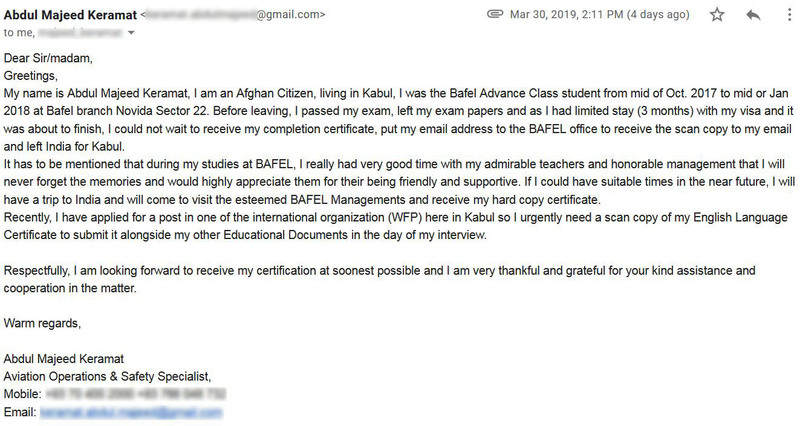 Before leaving, I passed my exam, left my exam papers and as I had limited stay (3 months) with my visa and it was about to finish, I could not wait to receive my completion certificate, put my email address to the BAFEL office to receive the scan copy to my email and left India for Kabul. It has to be mentioned that during my studies at BAFEL, I really had very good time with my admirable teachers and honorable management that I will never forget the memories and would highly appreciate them for their being friendly and supportive. If I could have suitable times in the near future, I will have a trip to India and will come to visit the esteemed BAFEL Managements and receive my hard copy certificate. Recently, I have applied for a post in one of the international organization (WFP) here in Kabul so I urgently need a scan copy of my English Language Certificate to submit it alongside my other Educational Documents in the day of my interview. Respectfully, I am looking forward to receive my certification at soonest possible and I am very thankful and grateful for your kind assistance and cooperation in the matter. I would like to thank BAFEL for their support to clear my IELTS Test with flying colours. Let’s begin with the requirement, because of which I joined BAFEL. I have applied to join Troy University in the Alabama state of U.S.A. for Aug’14 batch of M.S. (Computer Science) course. For the same, I have been asked by the authorities to clear the IELTS Test before May with at least 6.5 as the Overall Band Score. I was instructed to take either General Training module or Academic module for the admission as both were accepted but to my misery, only Academic session was available for May with 17th Jun 2014 being the earliest date available for General Training module on 11th Apr 2014, when I registered for IELTS. Hence, I registered for Academic module only, which was to be conducted on 24th May 2014. I was supposed to score a minimum of 6.5 in Overall Band Score to be eligible for getting admission to the Course. Since, I was raw in my speaking, writing, reading and listening abilities of English, hence I was looking for an Institute, which would help in sharpening my skills for better performance in the IELTS Test. I live in Sector-6, Dwarka and after certain enquiry and research, I was referred to Sector-7 branch of BAFEL as a good centre for English learning and improvement. I visited BAFEL on 14th Apr 2014 for the first time and after meeting Alka Ma’am and seeing the learning atmosphere being created here by the teachers, I was motivated to join. Gradually, my classes were scheduled daily from Mon to Fri from 7 p.m. to 8 p.m. from 15th Apr 2014. Understanding the state of my abilities in different modules of English after a week’s of regular classes, I was shifted from regular IELTS batch to a Customized one, wherein influence was given specifically on improving my English speaking and writing abilities, which lagged behind a little. With structured learning modules, efficient teaching staff and regular tests for all English modules, I was able to improve my skills and achieved an Overall Band Score of 7.0 in my IELTS Test with a score of more than 6.5 Band in all the modules, which I took on 24th May 2014. This enabled the authorities of the Troy University to invite me to join the Aug 2014 batch of M.S. (Computer Science) from their Institute. Now, I am continuing my customized classes for clearing my Visa interview, which is expected to happen anytime in the first week of July 2014. With BAFEL helping me with their structures learning sessions, I expect to be a winner in my Visa interviews also. For anyone wanting to take IELTS or TOEFL test for foreign settlement or is willing to improve their general English Skills, I would highly recommend BAFEL because of their highly proficient and learned faculty and structured Course material. Thanks for assisting me in my successful performance in IELTS. Respected M.D(Alka Gupta) This is to inform you that I Ajay Saini student of Patel Nagar Evening Batch got selected in Infosys Ltd. as a System Engg. I would like to thank Bafel and Harleen Mam for her guidance and moral (motivational) support. Dear Ma’am/ Sir, This is to bring to your kind notice that I had enrolled for IELTS course at your institution last month, I appeared for this exam on 26th October 2013 and have secured 7 band. I am writing this mail to thank my trainer from the bottom of my heart, that she had made me so very perfect to appear in this exam to achieve success. I again thank her once again to help me in achieving success in this exam. God Bless…!!! Dear Alka ma’am, this is to inform you that i Saurabh, a student of advanced gd and pi class at BAFEL Patel Nagar, want to say that i have been selected in The Oberoi group of hotels and resorts and The Grand ,New Delhi as Front Office assistant . i would like to thank Bafel for their immense support and specially Miss Harleen for her guidance throughout the classes and for her immense efforts. At first I would like to thank British Academy where I took admission for International English Language Testing system (IELTS) on 21st Aug’2008 at Satya Niketan, New Delhi. I am very happy with their teaching method and style. I hope all students will be able to learn and speak better English from this Institution in future. According to me people who have difficulty in speaking English can take the English learning course without any doubt and hesitation. Lastly I wish British Academy success. My Name is Arjun Kumar and I am a student of British Academy For English Language. British Academy provides an excellent environment where students can learn English. Before joining the British Academy I could not speak English at all but today I can. British Academy for English Language is very good. My Name is Asha Sehra. I am a student of British Academy for English Language. I am pursuing B.A. Nearly one month back I joined the Academy. Before joining this Academy I used to make lots of grammatical errors but now my basics are clear. I am very grateful to this academy. Its faculty members are trained professionals. BAFEL is giving training in such a manner that we can express ourselves in an effective manner. My name is Jyotika. I am a student of British Academy. I am pursuing BTEC HNC Course from Frankfinn. Nearly one month ago I joined this Academy. I had many problems in speaking English. Now I feel a vast improvement in myself. So I am very grateful to this Academy. I am Ritu Rani from Haryana. I am pursuing BTEC HNC course form Fankfinn Institute. I want to become an Air Hostess. English is the most important language to achieve my aim as it is an International language and everyone has to know English. So I had joined British Academy for English Language some time back. My name is Sachin Katoch. British Academy For English Language is a good institute because it has a highly qualified staff. There are many courses available for different levels. British Academy provides many facilities to students. Before I came to British academy I could not speak in English but now I can confidently express myself in English. Thank you BAFEL. I am Sanjay Rawat. I am a student of British Academy. I am also pursuing B.A. Program from Venky college. I joined this Academy 1month earlier. When I joined the Academy I was not able to speak in English properly. But now I am able to speak well. My name is Surender Kumar. I am a student of British Academy. British Academy for English Language is very good Institute. Before admission I was not able speak English but today I can speak. I was not able to understand grammar but now I can. Thank you BAFEL. I am Vimal Kumar Singh. I am a student of British Academy For English Language. I am also pursuing M.C.A. I am from a technical background so English is very important for me. Before coming to British Academy I did not have good knowledge about the grammar and I was not able to communicate in English. But now I speak English with my friends and teacher without any hesitation and with full confidence. BAFEL is a magical place to improve English and it provide good study material which is very helpful and easy to understand. Modeling is a world where everybody interacts in English. I used to feel very embarrassed when I couldn’t speak English well. I sincerely thank British Academy for English Language for giving me confidence in spoken English, and helping me feel comfortable in modeling high profile world. English has made my world so small. I can understand English and communicate with people from any country now. Thanks to British Academy for English Language. Coming to India became more than learning experience, I had ever imagined. Learning English improved my personality and raised my confidence level. It has certainly opened more doors than one. Life in India without English seemed impossible thanks to British Academy for English language to make me feel comfortable in English and thereby in India. We thank British Academy from the core of our hearts for teaching us so well that we not only improved our spoken English but we secured high % in our English board exams also.